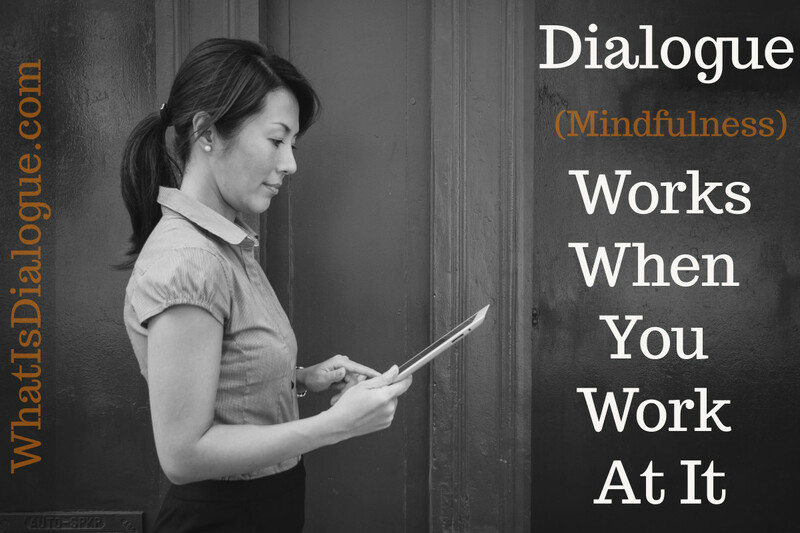 Dialogue Works When You Work At It - What Is Dialogue? Time, where’s the time. Space, how can I fit more into my busy life? Adding a new set of exercises and tasks to our already overloaded work-life seems impossible and yet that is exactly what we’re asking you to do when we introduce Generative Dialogue to your organization. What on earth could your CEO be thinking, to insert a new way of doing things into your team and done so while smiling on top of everything else. What’s going on? Can I believe that Dialogue works? Dialogue does indeed work and not only will it help you to go creatively deeper as individuals and as a team it will expand your companies Innovation chops and ROI. On top of all this good news it will once learned actually save time by helping you to clear out clutter already in your mind. Dialogue works by stretching mindfulness practice into a a way of communicating within your team and with each other in a way you’ve probably never experienced before. Dialogue Works When you Work At It. To jump start the process of experiencing how Dialogue Works it’s important to develop your own practice of mindfulness. Here are 4 steps to follow and remember as you embark on your new (or renewed) practice of mindfulness. The most important part of the practice is deciding to commit to it. Once we commit then spending time thinking about when and where the practice will occur is in order. Choose to practice in a time and space with the least distractions and at a time when you won’t fall asleep. Know you’re expectations for practice, at the beginning you’ll experience a cascade of thoughts. Mindfulness is about noticing thoughts are always streaming in your mind. Observe the thoughts without judgment of their content. This is a marathon not a sprint, allow your curiosity to watch everything. Let everything occur as it wants. After a few weeks you’ll start noticing coworkers and work situations in a mindful way. While interacting with people you’ll notice the content of their speech not the assumptions. At first this may seem strange, but it’s mindfulness engaging in your daily life. Spend time within the your Dialogue group exchanging the experiences each of you’ve each had. Remember to leave your assumptions and judgments at the door. ***EXTRA*** Your thoughts are your thoughts and not reality, they are just thoughts. Remember not to judge your thoughts as either good or bad, observe them as they pass by. The path of Dialogue is similar to working out at the gym, at first it’s difficult, but over time your mindful muscles will grow.